In 1775, a party of Spanish explorers crossed San Pablo Bay and found an excellent harbor at the Carquinez Straits, which they christened “Puerto de la Asuncion de Nuestra Senora”… Port of Our Heavenly Lady. 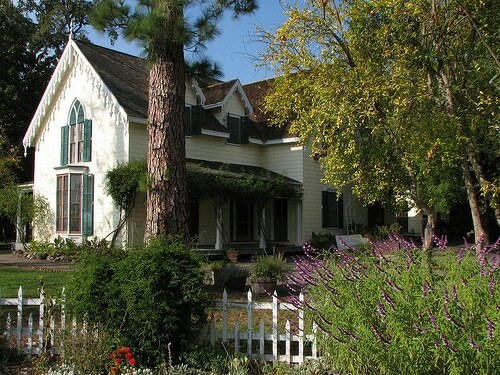 Although excellent reviews of the area were received, settlement of the location was considered some- what premature; no attempts were made to improve the site until it was deeded as part of Rancho Soscol to General Mariano Guadalupe Vallejo in 1844. Vallejo was familiar with the area; finding his favorite horse had survived drowning in the Carquinez Straits by swimming to an island, he named the spot “Isla de la Yegua (Mare Island) in her honor. 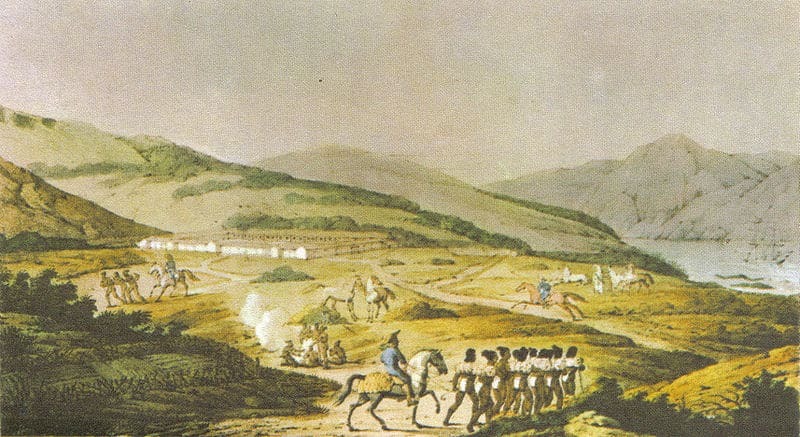 With the onslaught of Americans participating in the California Gold Rush, General Vallejo saw that the territory was destined to pass from the hands of the Mexican government to become part of the United States. He made a strong attempt to become involved in the establishment of a state capital on his lands. 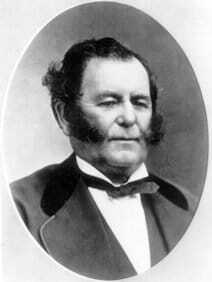 With statehood in 1850, the new California State Legislature considered Vallejo’s offer to move from San Jose. He offered to lay out a city, to be named “Eureka” or a name the Legislature might suggest, and to donate to the state 156 acres for the construction of a state capitol, university, botanical garden, state penitentiary, schools, hospitals, and asylums. In addition to the free land, General Vallejo also promised to give $370,000 to pay for construction of the buildings. A state-wide referendum on the matter was held in late 1850, and General Vallejo’s proposal was accepted, with one change-the city would be called “Vallejo,” after its founder. In 1851, the State Senate appointed a commission to layout the new state capital. They reported back that they had placed the capitol, the governor’s house, the university and several other public institutions on an elevated hill “immediately above the secure and commodious harbor of Napa Bay, from which, on a clear day might be seen the city and shipping of San Francisco.” The lunatic asylum was to be placed nearby, and the penitentiary on the nearest prominent hill to the Carquinez Straits, to serve as a warning to “rascals” on their way to the goldfields. By late 1851, all was in readiness, and the California Legislature convened in 1852 in Vallejo. Unfortunately for the legislators, the State Capitol promised by General Vallejo had not been built, and they were forced to meet in a leaking old structure, using barrels for seats and boxes for desks. Motions were immediately introduced to move the state capital out of Vallejo, and, after meeting for only eleven days, the Legislature moved to Sacramento for the remainder of the session. The following year, the Legislature again convened in Vallejo, for the purpose of moving the capital to Benicia, and on February 4, 1853, exactly two years after the seat of government came to Vallejo, it was moved to Benicia. While the state government was looking for a permanent capital site, others, including the U.S. Army and the U.S. Navy, became interested in the fine harbor between Mare Island and the mainland. 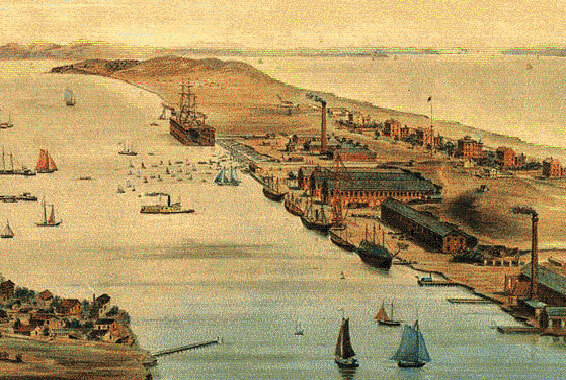 In July, 1852, the U.S. Congress purchased Mare Island for use as a naval shipyard, and on September 16, 1854, Mare Island became the first permanent U.S. naval installation on the West Coast. 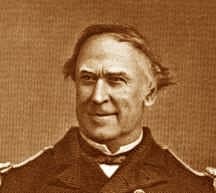 Captain David G. Farragut was assigned as Commandant of the new shipyard. An experienced naval officer, Farragut oversaw the shipyard’s first formative years, before being assigned to command the West Gulf Blockading Squadron at the out- break of the Civil War. He would later distinguish himself during the Battle of Mobile by rallying his men with the cry “Damn the torpedoes- Full speed ahead!” then successfully leading them through the mined waters of Mobile Bay. With a stable employment base, the tiny township of Vallejo was set to begin growing into city hood. By the mid-1860s, Vallejo had grown into a community with its feet in the rural world of farming and the urban world of ship construction. This changed with the organization of the California Pacific Railroad in 1867. The California Pacific was organized for the purpose of building a railroad from Vallejo to Sacramento, allowing passengers to travel via steamboat from San Francisco to Vallejo, then by rail to the state capitol and connection with the transcontinental line. Boasting a climate both warmer and sunnier than San Francisco, a busy wheat export trade, steady employment at Mare Island and Starr Mills, regular rail service, and inexpensive land, Vallejo experienced its first real estate “boom.” Incorporated in 1868, the city was laid out in a grid pat- tern and houses sprang up almost overnight, in styles ranging from simple “vernacular” cottages to large Italianate homes. Many neighborhoods began to achieve their distinctive appearance. Wealthy manufacturers and merchants built comfortable homes east of downtown, while smaller, “working class” residences and apartments were constructed overlooking the waterfront north of downtown. After a “stabilization” period following the boom of the 1870s, Vallejo again experienced a period of tremendous growth. This period began with the Spanish-American War of the 1890s and continued through World War 1, as the Navy increased the size of the fleet in the Pacific. The well-paid workforce of Mare Island needed homes, stores, bakeries, dentists, doctors, and many of the other amenities of life, and Vallejo quickly grew to meet the needs of its citizens. The city-owned waterworks began operation in 1894. By 1905, one could board a ferry to San Francisco, or an electric railroad car to Napa. Many of the city’s older neighborhoods grew up during this time, gaining much of the appearance they have today. Businessman George Wilson commissioned San Francisco architect Julia Morgan to design a large home for his lot on Capitol Street (1909), while renowned Vallejo architect William A. Jones built his home at 403 Alameda Street (1912). Eastern Georgia Street became the address for Vallejo’s professionals as doctors, lawyers, and businessmen moved into the large, comfortable homes. Western Georgia and the surrounding streets became the lynchpin for Vallejo’s downtown. Large municipal and commercial buildings were built, including the Vallejo City Hall (1927), the Empress Theater (1911), the Masonic Temple (1917), and the Vallejo YMCA (1919). Gold was discovered in California in 1848 and the great stampede from the eastern reaches of the broad American continent was underway. This sudden migration westward made it immediately imperative for the United States Navy to establish a base on the West Coast from which ships of the Pacific Squadron could operate and at which they could be repaired. In 1850, Commodore John Drake Sloat was ordered to lead a surveying party in quest of a logical site for the nation’s first Pacific naval installation. Sloat, who had claimed California for the United States four years earlier at Monterey, recommended the island across the Napa River from the little settlement of Vallejo. This long, low segment of land had been called Isla Plana by the first settlers of the region. Legend has it that the name was changed when a favorite white mare owned by General Mariano Guadalupe Vallejo, Mexican Commandante for Northern California, fell off a raft while being ferried across Carquinez Straits and swam ashore on the island. Vallejo renamed it “Isla de la Yegua,” or Mare Island. Charts prepared by Navy cartographers in Sloat’s surveying party bear the inscription “Site of Vallejo, Seat of Government of California” opposite Mare Island. California’s government stopped there only briefly, moving on to Benicia in 1853, and to Sacramento a short time later. But the U.S. Navy stayed for the next 142 years. Navy Department officials acted favorably on Commodore Sloat’s recommendation and purchased Mare Island in 1852 for $83,410. Commander David Glasgow Farragut arrived September 16, 1854,aboard the USS WARREN. He immediately took command of Mare Island and commenced the creation of a naval base that eventually became the largest of its kind in the nation. Farragut departed in 1858 to gain immortal fame at Mobile Bay. His cry of “Damn the Torpedoes, Full Speed Ahead!” shall always remain among the most renowned of American naval expressions. But possibly the greatest monument to his devotion to the naval service is at Mare Island where he launched an arsenal of strength that would influence the success of the United States for nearly 150 years.